Yahoo Messenger is one of the most user IM clients in the world, and many users use it for to IM at work, IM with friends and family and more. Yahoo messenger has several shortcut keys, using which you can buzz a person, add emoticon/smileys to your messages and more. I have already Posted How to Chat With Multiple IDs In Yahoo Messenger and Keyboard Shortcuts.These Shortcut Keys will help you to Chat Fast. 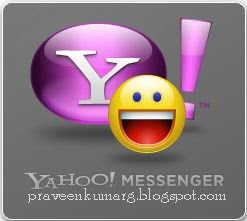 Windows Key + Y – Bring Yahoo Messenger to Focus, works even if Yahoo Messenger is sitting in the system tray. Ctrl + G – Buzzes the contact you are chatting with. Ctrl + H – Show or Hide offline contacts in main messenger Window. Ctrl + Shift + P – Open preferences window. Ctrl + M – Provides a option to send a Instant message. Ctrl + T – Provides a option to send a SMS message. Ctrl + L – Provides a option to make a call. Ctrl + K – Provides options to Call a phone number. Ctrl + Y – Send a email message. Ctrl + Shift + A – Provides options to add a contact. Ctrl + Shift + 0,1 or 2 – Switches between different messaging formats provided by Yahoo Messenger 9 and above. Esc key – Closes a active message window. Ctrl + D – Sign out of Yahoo Messenger. Ctrl + Shift + D – Sign out of Yahoo Messenger client and sign in to your mobile device. Ctrl + Shift + F8 – Change your display Image. Ctrl + Shift + C – Send you contact info in a active chat window. Ctrl + Shift + M – Send you messenger friend list in a active chat window. Ctrl + Shift + R – Request contact details in a active chat window. Ctrl + B – Toggle bold on or off, or convert selected text to bold. Ctrl + I – Toggle italic on or off, or convert selected text to italic. Ctrl + U – Toggle underline on or off, or convert selected text to underline. for big grin and so on. Yahoo messenger provides you with a complete list of shortcuts for typing in emoticons, in addition to the normal emoticons there are also several hidden emoticons which are not even available from Yahoo Messenger and requires you to use keyboard shortcuts. Want more such hidden emoticons, check out the Yahoo Messenger page for hidden emoticons.